I had a great sleep and was up at 4am to get ready for my early morning flight. I felt very excited, just like the feeling you get when you are a kid on Christmas Day when you get to see all the presents Santa had left the night before. Really looking forward to getting on the plane and beginning my journey. When I got to check my luggage in I found out my box was a little too heavy (35kgs). So had to repackage the box and do lots of smiling and laughing with the check-in staff. They were really good and no excess luggage fees had to be paid :). Whilst waiting in the boarding area I saw my bike box get loaded on the plane. So at least I know it'll be there at the other end. The flight itself was uneventful and just after 8am we had arrived in Adelaide. When I got off the plane my bike was waiting for me. I spent the next 45 minutes putting it back together. 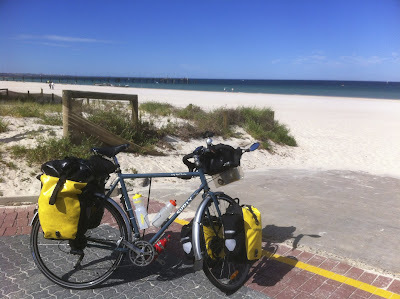 Noticed I had forgotten one of my water-bottles, so on my way to Glenelg I made a quick stop at the local bike shop. Glenelg is a major beach suburb on the end of the tram line in Adelaide. I stopped for a quick bite to eat and a look around. It was only 10am and it was getting pretty warm. My phone was saying it was already 30c and expecting to get to 35c. 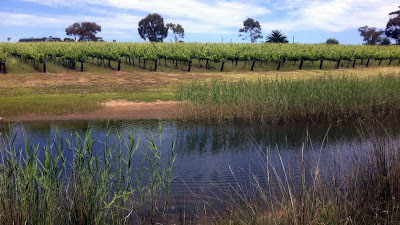 So I got back on the bike and followed different bike paths which would take me to McLaren Vale. Adelaide has a number of bike paths, which meant I was hardly on any roads. There were a couple of spots though where there was a lack of signs, but I was able to keep on the Coast to Vines trail all the way to McLaren Vale. I arrived in McLaren Vale at about 1pm. With it being pretty hot and also my first day touring, I decided to stop here for the night. Also the campsite has a pool which I'll be making good use of. McLaren Vale is a wine growing region of South Australia. The cycle trail that brought me here went past a number of vineyards. So it was a nice way to arrive in town. This afternoon I'm just relaxing and buying a bit of food for the next couple of days. Even though today was pretty hot, the riding was really pleasant. Think it helped having good cycle paths and a nice tailwind. Will most likely leave early tomorrow to try and beat the heat.